From left: Mark Dissinger, of Downtown Milford Inc.; Irv Ambrose, President of Downtown Milford Inc.; Ken Anderson, DEDO’s director of Entrepreneurial and Small Business Support; Diane Laird, State Coordinator for Downtown Delaware; Amy Perfetti, co-owner, Delaware Branding Company; Lee Nelson, Executive Director of Downtown Milford Inc.; Mike Perfetti, co-owner, Delaware Branding Company; Milford Mayor Bryan Shupe. MILFORD, Del. 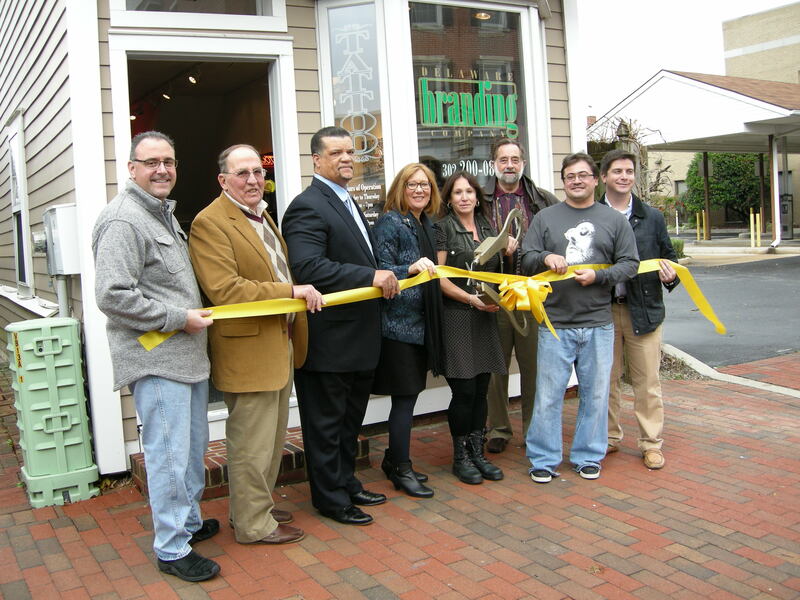 (Dec. 3, 2014) – From art galleries to performing arts and, more recently, even culinary arts, Downtown Milford continues to build on an arts-related retail strategy. The arrival of Delaware Branding Company now adds graphic design to support this downtown strategy. State and local officials joined business owners Mike and Amy Perfetti for a ribbon cutting on Wednesday Dec. 3, outside of the business at 19 NW Front Street. Delaware Branding Company, a participant in this year’s Project Pop-Up program, will offer graphic design, sign making, body art, and DJ services at its new location. Project Pop-Up, now in its third year, provides three months of rent-free commercial space during the holiday season along with the assistance of a business advisor to help launch and grow the business. The program has grown from three participating businesses in 2012 to 15 this year, including nine businesses in an incubator in Wilmington. Delaware Branding Company also sells magnetics, banners, aluminum and wood signs and provides logo design, business card and flier design and van, truck and boat lettering. Diane Laird, State Coordinator for Downtown Delaware, said that Milford has been an excellent partner in Project Pop-Up. Laird said she and Ken Anderson, Director of Entrepreneurial and Small Business Support for the Delaware Economic Development Office, have worked together with Milford representatives to match businesses with available properties that support the arts focus in downtown. In 2005, Perfetti was honored by the Hospitality Sales and Marketing Association International (HSMAI) for Outdoor Transit Advertising in 2005. The Perfettis would love to duplicate the success experienced by several Pop-Up selectees in Milford, Middletown, and Smyrna, who have already expanded their shops due to significant growth and expansion of their customer base. In Milford, Paige Deiner, a 2013 Pop-Up participant in Milford, saw business quadruple just months after opening, necessitating a move to a larger facility where she now offers massage, Reiki, yoga and self-development classes. Karen Gill, owner of Royal Treatments in Smyrna, just expanded into a vacant space adjacent to her Pop-Up shop, which is now home to Smyrna Cards and Gifts. The Delaware Economic Development Office is an executive state agency responsible for attracting new investors and businesses to the state, promoting the expansion of existing industry, assisting small and minority-owned businesses, promoting and developing tourism and creating new and improved employment opportunities for all citizens of the State. Visit dedo.delaware.gov. Downtown Delaware, a program of the Delaware Economic Development Office, provides Delaware’s historic downtowns, communities, and small businesses with tools to revitalize their commercial districts, increase entrepreneurial opportunity, and enhance quality of place. To learn more about the Main Street program, visit www.delawaremainstreet.com.